DIAL: Black dial with applied indexes and tritium lume plots. Outer white minutes ring on the periphery of the dial. Black tachymeter inner bezel. White baton hands with orange chronostop seconds hand. BRACELET: Original Omega bracelet with full links, reference 1117 with ‘549’ end links. CONDITION REPORT: The dial and hands are original and in mint condition. The case is unpolished and in mint condition. The plexiglass is also unpolished and original. Lastly the bracelet has full links and still feels tight from original factory finish. NOTES: These are watches rare and unique with their single push stopwatch function. The mechanism is designed so that the user presses the pusher once to start the orange stopwatch hand. Then, presses it again and holds it down to stop the stopwatch and read the time elapsed and, finally, release the pusher to reset the hand to zero. This is a particularity of the 865 Caliber introduced in 1966. 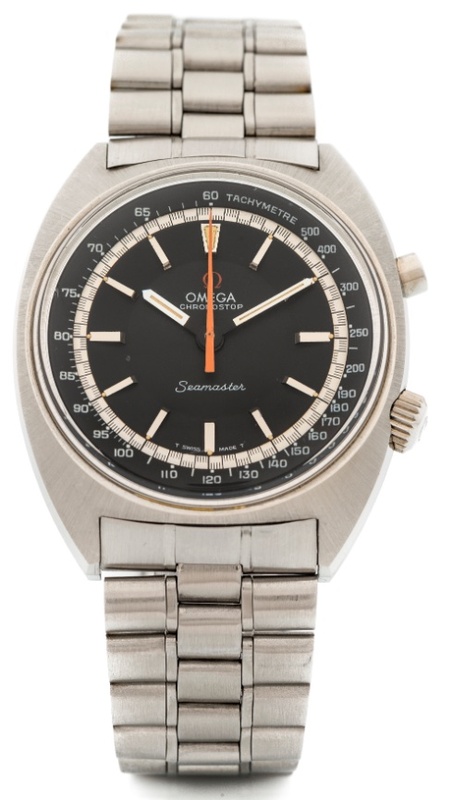 This Seamaster Chronostop model was released shortly before the Olympic Games in Mexico City 1968.